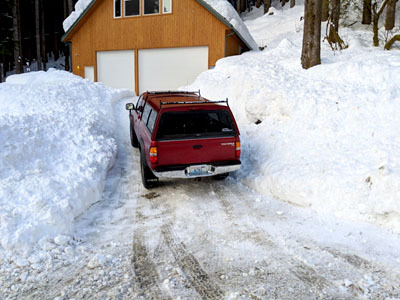 Many experienced having to shovel their driveway. Perhaps not to the extent that Dwight Small, K7KG, had to deal with. He assures us that he did this by hand. Yes, that’s the same Toyota 4×4 that I used to drive. 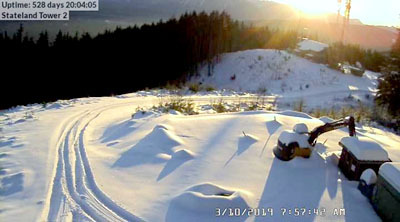 This one is the Accelnet Tower Cam on March 10th on West Tiger at sunrise. The tracks are from snow machines. 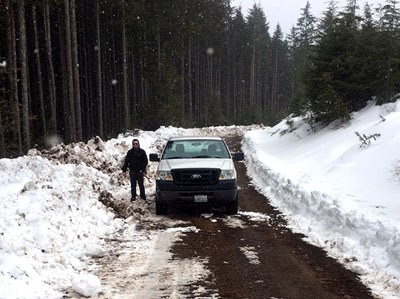 On March 6th, someone plowed part of the road up West Tiger. Terry and Caleb checked it out. Unfortunately, they had to walk the rest of the way, about 2.5 miles. 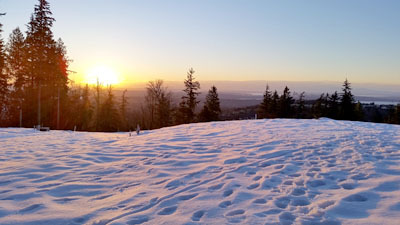 Terry said it had been a month since he was able to reach his transmitter at West Tiger-2. Unfortunately, no one plows the road to the top of the mountain for us. We are not the only place in the country where winter weather demonstrated who’s boss. In this case, the wind had its way with a tower on Sugarloaf Mountain in Maine. Sugarloaf Mountain’s elevation is 4,259. That’s 1300 feet higher than West Tiger. Can you imagine if this happened to one of those big towers that adorn the hills of Seattle? 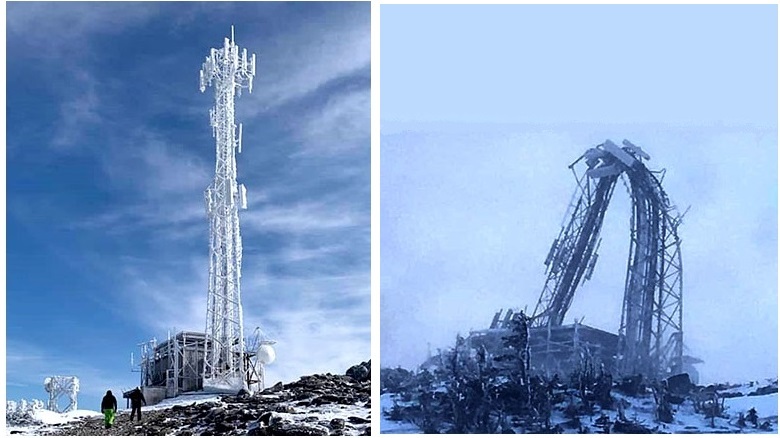 Not likely, as at that elevation, the tower had collected a large load of Rime Ice and then was hit with winds of over 100 mph. After this failure, Wayne Davidson posted some interesting comments. So who is he? Wayne did a lot of design work for Magnum Tower Company. 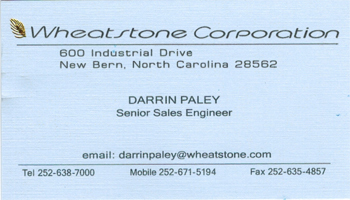 It was through them that I worked with him back in the late 1980s, on the first broadcast tower on West Tiger. 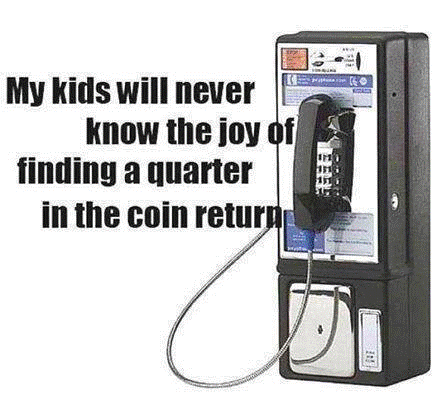 Thankfully it is still standing! After reading his comments, I reached out to him and asked permission to reprint what he posted. This provides a very interesting perspective on these towers that are vital to the role of broadcasters everywhere. Nothing that man designs or builds lasts forever – not even the Egyptian Pyramids. Having said that, man has managed to build some structures (towers) that will last a very, very long time. All towers are not created equal. I have designed somewhere on the order of 3500 towers and poles during my career. Many towers were designed to withstand environmental conditions (wind and ice combinations) which are never expected to occur – not ever. I have designed numerous towers of that type – mostly for state agencies, local municipalities, and large corporations that have very deep pockets and for which the failure of the tower is known to have extremely dire consequences. a self-supporting tower in Slide Mountain near Lake Tahoe. Those towers should last indefinitely with proper maintenance. Probably the most famous example of a tower that has a very long life expectancy is the Eiffel Tower. It was designed using the math-graphical method in which the shape of the tower was determined by the geometry required to keep its composite legs in compression (no tension allowed). It was also designed for a wind force shape factor of 2 at a time when most structures utilized a force factor of 1.5. Bear in mind that the Eiffel Tower was only supposed to remain for 20 years after which time the tower was to be demolished. There was great opposition to its original construction. Today, it is recognized worldwide as a tremendous leap forward in man’s engineering capabilities and is considered a great thing of beauty. By the way, the Shasta Bally tower was subjected to an ice and wind condition that by far exceeded its extreme design criteria. I have a couple of photos showing the tower completely filled solid with ice and with about 15 feet of rime ice projecting off of one face. That condition alone would be enough to collapse most towers in existence. Some very high winds came along during that ice event to really ‘test its mettle’. The tower is still standing. The interesting thing is that the cost of building some very serious longevity into a tower is not proportional to its life expectancy. That is to say, a 50 percent increase in structural capacity is purchased at far less than 50 percent increase in cost. One can generally make substantial strength and capacity gains with very little additional capital investment. Moreover, stochastic probabilities of extreme wind and ice events are non-linear. For wind, it only takes a 7-percent increase in basic wind speed to move from a 50-year to a 100-year mean recurrence interval. 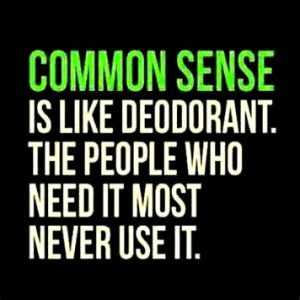 That is primarily why our building codes and standards are becoming more and more demanding in terms of design criteria. There is minimal cost associated with providing an ever-wider margin of safety. If that cost was substantial, then we would not tolerate it and we would “throw the bums out” (meaning those individuals responsible for making construction economically infeasible). One of my clients coined the phrase: “Where there’s a will, there’s a Wayne.” I like to think that we humans can do almost anything – if we put our minds and enough resources to it. We managed to land several men on the moon, and miraculously brought them home safely. Eventually, my guess is that building codes and standards will become sufficiently demanding that tower failures will become an extremely rare occurrence. We are almost at that point now. 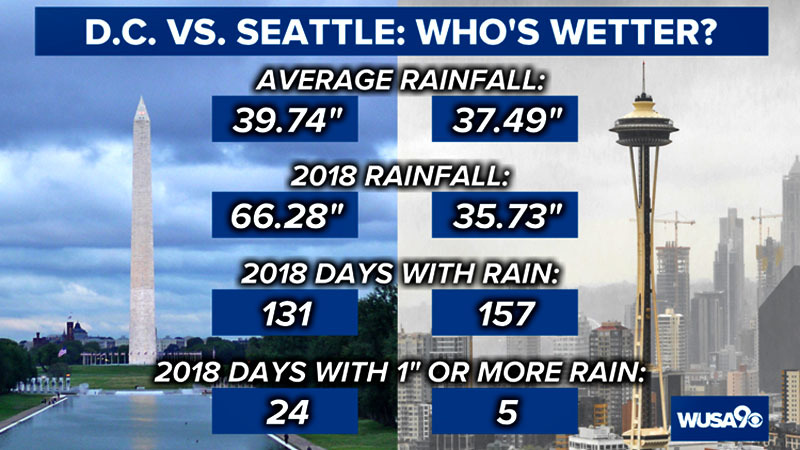 It’s a contest we don’t want to win, but Washington, D.C. is actually wetter than Seattle, Wash! Of course, Seattle is the city many think of when it rains – locals consider it a badge of honor to not carry an umbrella, for example – but when it comes to actual inches of rain falling, DC has them beat. Seattle only did that five days in 2018, while D.C. managed that feat on 24 days…almost five times what Seattle saw. 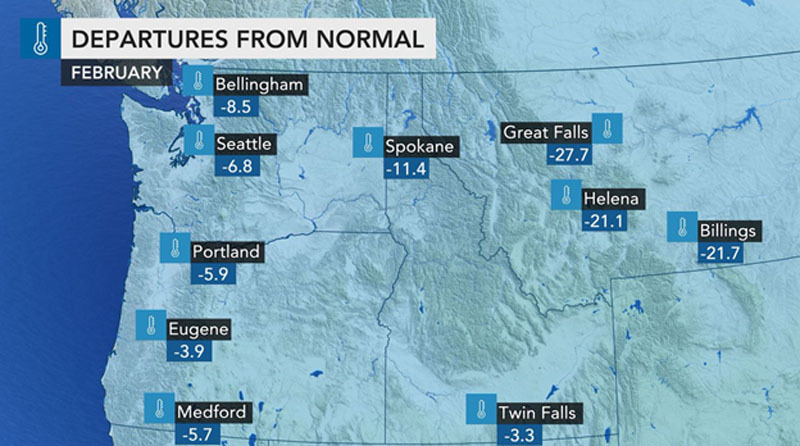 The colder Pacific Ocean and associated atmosphere in the Pacific Northwest just doesn’t hold as much moisture as the warmer, sometimes tropical atmosphere that D.C. sees helped by The Gulf Of Mexico and Atlantic Ocean. Sinclair Radio’s KOMO is the clear winner on the AM dial, even if you have to look at 15th place to find them. Actually their numbers are improving. The same cannot be said for the next ranked AM, KIRO, whose numbers are descending. Perhaps a factor of the end of football season. Now if the M’s do well this year. Interesting that KIRO and KTTH are tied. I recall when we were introducing HD. Managers were salivating over the thought that they were getting another radio station to add to their stable without having to go out and buy one. Slowly times are changing. What many don’t understand is that the progress of HD Radio is often hindered by the very companies that own them, i.e., an ‘internal-problem’. Being an ‘old-guy’ I recall hearing the same arguments, many years ago. The comments then were being made by owners and managers of AM stations talking about that mode called FM! Looking back, Radio feared TV, owners of the livery stable feared the automobile…and so it goes. Over the years, readers of this column often read about broadcast operations on mountain-tops. I related this information for a couple of reasons. 1) This is primarily what I do, and 2) It’s an aspect of Broadcasting that is often never seen or understood. The fact is, the majority of those who work in Radio or TV have never been to the station’s transmitter location! Generally, the work of a Broadcast Engineer at these sites, contrary to popular opinion, does not involve climbing towers, but rather the maintaining of the various electronic systems that are housed in the building nearby. There can be some aspects of this work that are dangerous, as you are occasionally, called upon to deal with high voltages, climb ladders (inside), deal with sharp objects etc. Very seldom do you hear of someone being killed in this work. Unrelated to Greg’s move, Austin Randazzo who was formerly in the FCC EAS office, has now also received a promotion. Every once in a while, someone I have worked with over the years many times, is honored. In this case, The Association of Public Radio Engineers is honoring Jeff Welton from Nautel. The ceremony will take place at the Public Radio Engineering Conference (just prior to NAB) in Las Vegas on April 5th. Recipient of the SBE’s James C. Wulliman Educator of the Year Award for 2018, Jeff writes articles and performs presentations every year on the topics of lightning protection, grounding, transmitter site safety and various other subjects of interest in the broadcast engineering field, as well as being a contributor to the 11th edition, NAB Engineering Handbook, authoring the chapter on Facility Grounding Practice and Lightning Protection, among others. Alpha Media – Alaska is seeking an experienced Staff Engineer for our radio facilities in Anchorage and Wasilla. 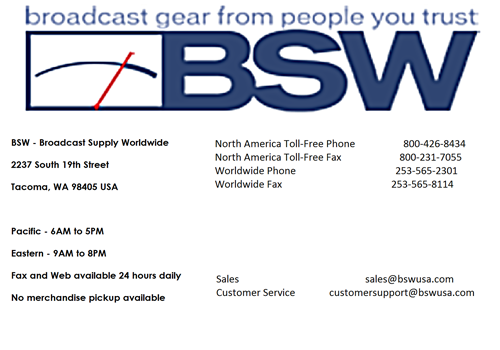 Reporting to the Market Manager will be responsible for the maintenance of equipment, maintaining broadcast systems and technologies, build out projects, and ensure FCC compliance. The successful candidate will be familiar with radio related technologies including, but not limited to, networking and IT, PC/software maintenance and repair, AM and FM transmitter repair and installation, VHF and UHF radio technology, digital and analog audio, EAS equipment and studio equipment maintenance. That’s about it for this month, my friends. Thanks for the read. Lord willing, I will be back to most of the same locations next month at this time.